Highland Mennonite Brethren Church, Calgary, AB. Alberta Mennonite Brethren Missions started a city mission in Calgary in the 1950s. From this emerged the Calgary Mennonite Brethren Church in 1956 with 41 charter members. Jacob A. Froese is considered the founding leader of the group. They met in rented facilities until 1962, when they completed their own sanctuary. Later an educational wing was added. In 1980 the membership stood at 311. In 1983 they divided the congregation to form the Dalhousie Mennonite Brethren Church. Mennonite Brethren Herald (27 May 1988): 6; (21 February 1992): 13; (December 2008); (February 2012): 29. Mennonite Observer (25 May 1956): 3. Penner, Peter. No Longer at Arm's Length: Mennonite Brethren Church Planting in Canada. Winnipeg, MB: Kindred Press, 1987, 178 pp. Available in full electronic text at: https://archive.org/stream/NoLongerAtArmsLengthMBChurchPlantingInCanadaOCRopt?ref=ol#mode/2up. Toews, John A. A History of the Mennonite Brethren Church: Pilgrims and Pioneers. Fresno, CA, 1975: 166. Available in full electronic text at: https://archive.org/details/AHistoryOfTheMennoniteBrethrenChurch. Centre for Mennonite Brethren Studies, Winnipeg, MB: Volume 328. Epp, Marlene. "Highland Mennonite Brethren Church (Calgary, Alberta, Canada)." Global Anabaptist Mennonite Encyclopedia Online. July 2016. Web. 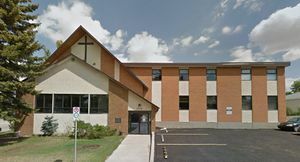 20 Apr 2019. http://gameo.org/index.php?title=Highland_Mennonite_Brethren_Church_(Calgary,_Alberta,_Canada)&oldid=163620. Epp, Marlene. (July 2016). Highland Mennonite Brethren Church (Calgary, Alberta, Canada). Global Anabaptist Mennonite Encyclopedia Online. Retrieved 20 April 2019, from http://gameo.org/index.php?title=Highland_Mennonite_Brethren_Church_(Calgary,_Alberta,_Canada)&oldid=163620. This page was last modified on 11 March 2019, at 02:11.